Khön Family Lineage of Vajrakilaya - The special transmission of Vajrakilaya practice held by the descendants of the Khön family down to the present Sakya Trizin, which can be traced back to Khön Nagendrarakshita, a direct disciple of Guru Rinpoche. "Of the profound and inexhaustible ocean of teachings that Guru Padmasambhava possessed, Vajrakilaya is one of the most important. 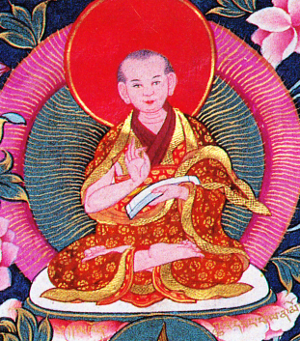 Its empowerment, teachings and pith instructions were given to one of his most important spiritual disciples, Khön Nagendrarakshita (Lü'i Wangpo Sungwa), who then practised it until he achieved both ordinary and supreme siddhis. As a sign of his great attainment, he managed to display the great miracle of keeping his vajra and bell suspended in space. Guru Padmasambhava himself declared that Nagendrarakshita had attained the eighth stage of the great bodhisattva path. The Vajrakilaya empowerment, teachings and pith instructions then passed down from Nagendrarakshita to his own nephews, as they were appointed as the holders of the Khön lineage; and ever since then they have been passed down through this lineage, which includes the five Sakya patriarchs. So this is a very rare teaching that has not only continued through an unbroken lineage from the primordial Buddha, but has also been passed down through the hereditary lineage. Each of these masters, from Guru Padmasambhava to those of the present, has achieved great realization, and as a result has performed great miracles. I myself received this from my own father, as well as from one of my most important root gurus, both of whom attained great realization through the Vajrakilaya practice, and showed many significant miracles." As His Holiness mentions, he received the transmission of the practice from his own father, Vajradhara Ngawang Kunga Rinchen, and from his root teacher, Ngawang Lodrö Shenpen Nyingpo, as well as from Ngor Khangsar Shabdrung Lodrö Tenzin Nyingpo. H.H. Sakya Trizin, Lerab Ling, 22-23 June 2007. H.H. Sakya Trizin, Rigpa Berlin Centre, 4-5 July 2010. This page was last edited on 7 November 2010, at 12:26.